Providing you the best range of daily wear salwar kameez, exclusive salwar kameez, salwar kameez, chanderi designer salwar, churidar cotton salwar kameez and pakistani salwar kameez with effective & timely delivery. We are the Leading Supplier,Trader ,Exporter and Wholesaler of Exclusive Sunny Leone Salwar Kameez in Chennai,Tamilnadu,India. 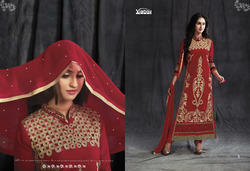 We are well known garment based organization, engaged in presenting quality range of Salwar Kameez. The given range of salwar kameez is stitched by using top quality soft fabric material and advanced machinery keeping in mind latest trends. Our presented collection looks more beautiful with the matching accessories. Our Customers can purchase this range from us in vivid colors combination and designs patterns as per their needs. Focused only on client’s needs & market desires, we are engaged in manufacturing, trading, exporting and supplying an exclusive range of Churidar Cotton Salwar Kameez. The exclusive range offered by us is stitched on keeping latest trends & fashions, under the guidance of talented fashion designers. The offered collection is available in various designs as our customers’ needs so that they will not get confused while choosing quality of suits. Our cotton range is easily available at fixed prices. We are leading Supplier, Trader, Wholeseller and Exporter of Patiyala Salwar Kameez.It is due to our ability to meet the bulk orders that we have been able to gain a commendable position in this domain. The optimum quality of the offered dresses is maintained at all times through various quality assurance checks conducted our team of quality controllers. We are leading Supplier, Trader, Wholeseller and Exporter of Patiyala Salwar Kameez. 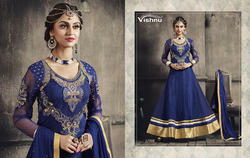 Looking for Salwar Kameez ?